Democrat Doug Jones was the projected winner of Alabama's special Senate election on Tuesday, beating back history, an embattled Republican opponent and President Donald Trump, who urgently endorsed GOP rebel Roy Moore despite a litany of sexual misconduct allegations. NBC News projected it to be the first Democratic Senate victory in a quarter-century in Alabama, one of the reddest of red states, and proved anew that party loyalty is anything but sure in the age of Trump. The projected Republican loss was a major embarrassment for the president and a fresh wound for the nation's already divided GOP. "We have shown not just around the state of Alabama, but we have shown the country the way — that we can be unified," Jones declared as supporters in a Birmingham ballroom cheered, danced and cried tears of joy. He added, "This entire race has been about dignity and respect." From the White House, Trump graciously tweeted his congratulations to Jones "on a hard-fought victory" — but added pointedly that "the Republicans will have another shot at this seat in a very short period of time. It never ends!" He followed up Wednesday morning by tweeting that he was right that Moore would not be able to win the election, and that "Roy worked hard but the deck was stacked against him!" Jones is set to take over the seat previously held by Attorney General Jeff Sessions. The term expires in January of 2021. NBC News called Jones the apparent winner around 10:45 p.m. ET. He was projected the winner at 8:34 a.m. ET Wednesday. More of the outstanding vote has been counted, leaving no possibility of a mandatory recount. 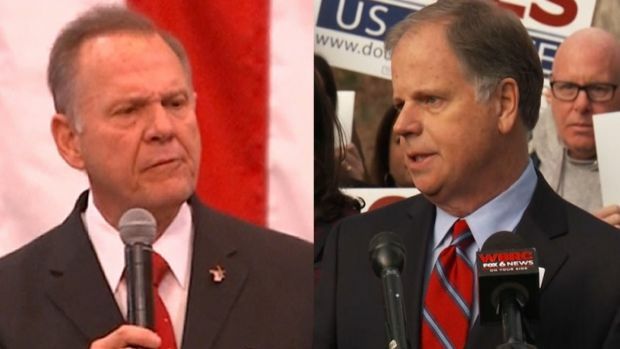 The projected victory by Jones, a former U.S. attorney best known for prosecuting two Ku Klux Klansmen responsible for Birmingham's infamous 1963 church bombing, would narrow the GOP advantage in the U.S. Senate to 51-49. That imperils already-uncertain Republican tax, budget and health proposals and injects tremendous energy into the Democratic Party's early push to reclaim House and Senate majorities in 2018. Still, many Washington Republicans viewed the projected defeat of Moore as perhaps the best outcome for the party nationally despite the short-term sting. The fiery Christian conservative's positions have alienated women, racial minorities, gays and Muslims — in addition to the multiple allegations that he was guilty of sexual misconduct with teens, one only 14, when he was in his 30s. Republican Roy Moore, facing numerous allegations of sexual misconduct with teenage girls, and Democrat Doug Jones cast their ballots in the vote that will send one of them to the U.S. Senate. NBC's Chris Pollone reports. "Tonight's results are clear — the people of Alabama deemed Roy Moore unfit to serve in the U.S. Senate," said Colorado Sen. Cory Gardner, who leads the national GOP's Senate campaign arm and called on Moore to quit the race weeks ago. The projected Republican loss also gives Democrats a clearer path to a Senate majority in 2018 — albeit a narrow one — in an election cycle where Democrats are far more optimistic about seizing control of the House of Representatives. 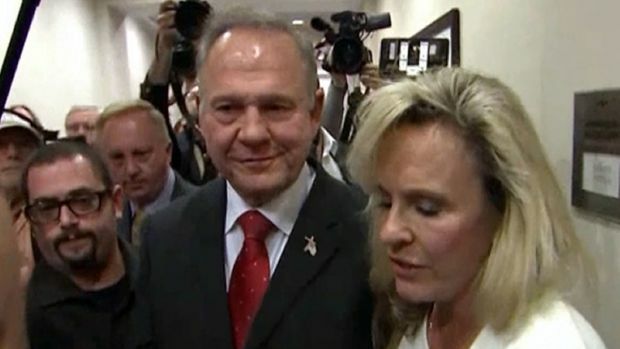 Kayla Moore, wife of Republican Senate candidate Roy Moore, pushed back against charges of anti-Semitism and racism against her husband in a rally before Alabama's special election, noting that Moore had appointed the first black marshal to the state supreme court, had a Jewish attorney and that the couple had both black and Jewish friends. At his election night headquarters, stunned supporters erupted in celebration as news of his apparent victory was announced. Many danced to the song "Happy." Some cried. Moore is not conceding to Jones, telling campaign supporters "it's not over." "It's going to take some time," the candidate said during a brief appearance before supporters. Campaign chairman Bill Armistead said that because the vote is close and approaching the state's recount requirement, "we do not have a final decision on the outcome." Alabama state law calls for a recount if the margin of victory is less than one-half of one percentage point. With all precincts reporting, Jones leads by 1.5 percentage points — three times what's required to trigger a recount.